Altruvest Charitable Services welcomed participant for the first BoardMatch Leaders training session of 2017 on March 30 in Toronto. Attendees were a diverse group of current charitable board members, non-profit sector managers, corporate representatives and students. They all came to learn more about the non-profit sector and the role of a charitable board. 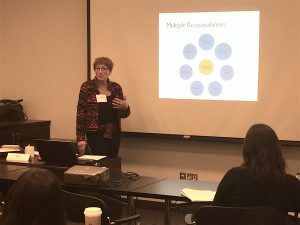 In the updated BoardMatch Leaders training, Facilitator Ruth Armstrong, of Vision Management Services, led the group in an intellectually-stimulating day of case studies and practical tips and tools for being an effective board member. She imparted the vital and challenging roles of a charitable board in decision-making by consensus, balancing the needs of multiple stakeholders and the duties of care. Everyone who attended gained valuable knowledge and tools to bring to their current or future board roles. Join us for future BoardMatch Leaders training sessions to learn how to be an effective board member. Our next session of BoardMatch Leaders takes place on June 21st, 2017 in Toronto. Registration will open soon. For more information contact us at information@altruvest.org.